Dimensions 2.25 by 7 by 10 in. Thomas Pikettyâs Capital in the Twenty-First Century is the most widely discussed work of economics in recent history, selling millions of copies in dozens of languages. But are its analyses of inequality and economic growth on target? Where should researchers go from here in exploring the ideas Piketty pushed to the forefront of global conversation? A cast of economists and other social scientists tackle these questions in dialogue with Piketty, in what is sure to be a much-debated book in its own right. After Piketty opens with a discussion by Arthur Goldhammer, the bookâs translator, of the reasons for Capitalâs phenomenal success, followed by the published reviews of Nobel laureates Paul Krugman and Robert Solow. The rest of the book is devoted to newly commissioned essays that interrogate Pikettyâs arguments. Suresh Naidu and other contributors ask whether Piketty said enough about power, slavery, and the complex nature of capital. Laura Tyson and Michael Spence consider the impact of technology on inequality. Heather Boushey, Branko Milanovic, and others consider topics ranging from gender to trends in the global South. Emmanuel Saez lays out an agenda for future research on inequality, while a variety of essayists examine the bookâs implications for the social sciences more broadly. Piketty replies to these questions in a substantial concluding chapter. 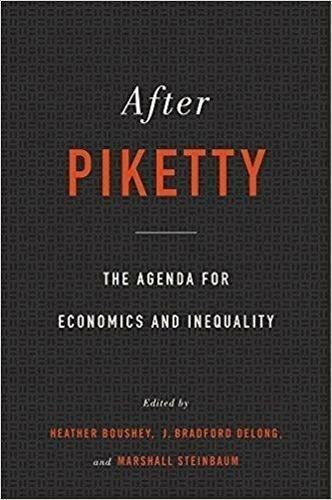 An indispensable interdisciplinary work, After Piketty does not shy away from the seemingly intractable problems that made Capital in the Twenty-First Century so compelling for so many.